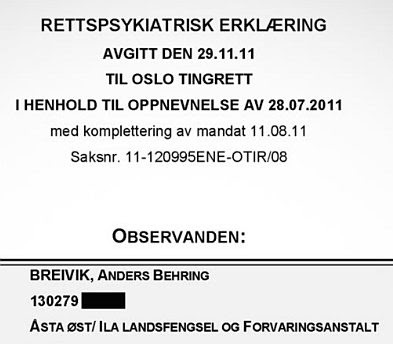 In a few days the trial of Anders Behring Breivik will begin in Oslo. Fjordman, who has just finished reading the entire text of the killer’s manifesto, offers some insights into what lies ahead. On April 10, a second psychiatric probe into the mind of mass murderer Anders Behring Breivik stated that he was not psychotic at the time of his terror attacks and can thus be held criminally responsible for his actions. This report reopened the debate on whether the self-confessed killer can be sent to prison or be held in a secure psychiatric unit. “The experts’ main conclusion is that the accused, Anders Behring Breivik, is not considered to have been psychotic at the time of the actions on July 22nd, 2011,” the Oslo district court stated. “That means that he is considered criminally responsible at the time of the crime.” Experts Agnar Aspaas and Terje Tørrissen warned in a court statement that there is a high risk of repeated violent actions from ABB due to his personality and his lack of empathy with other human beings. Their report is based on eleven interviews with the accused plus police interrogation transcripts, but also on three weeks of permanent observation, something which had not been conducted during the first psychiatric evaluation. Breivik himself was very pleased with the new conclusion. He had felt insulted by being declared insane earlier, and had worked hard together with his lawyers to be declared sane this time. Ironically, the mass media and political establishment were mostly just as pleased with the decision as was the terrorist himself. The second psychiatric evaluation had been ordered following prolonged pressure from the mass media, which intensely disliked the first report and its inconvenient conclusion, but are satisfied with the new one. The trial of Breivik will begin in Oslo on April 16, with closing arguments on June 21-22. The verdict is expected in mid-July. My testimony is scheduled for early June. The second pair of forensic psychiatrists, Agnar Aspaas and Terje Tørrissen, state that Breivik is not insane but rather is an extreme narcissist, as should be evident to all those who have heard or read his comments, regardless or whether they think he is insane. Aspaas and Tørrissen suggest that he suffers from a dysfunctional personality disorder that resembles psychopathy, with a total disregard for the well-being of other people around him. They dispute, however, the assertion that he suffers from paranoid schizophrenia or was psychotic when he carried out his attacks, which the first pair of forensic psychiatrists Torgeir Husby and Synne Sørheim had concluded in their report from late 2011. Both of these views have received some professional support, partly because Breivik really is hard to classify. Dr. Michael Welner is an American forensic psychiatrist and chairman of The Forensic Panel. He has acted as a forensic psychiatric examiner or consultant in numerous criminal or civil court proceedings in the USA, particularly in complex cases. He has a good understanding of depraved minds. Welner was interviewed by Michael Kelley on the Canadian television outlet CBC TV News on July 26, shortly after Breivik’s terror attacks. At that point, Welner rejected the idea that ABB is insane, something which his defense lawyer Geir Lippestad had already indicated might be the case, suggesting rather that he comes off as quite lucid. He even went so far as to suggest that it is an insult to people who suffer from serious psychiatric problems, most of whom never harm other people, to suggest that Breivik is mentally ill. The above statements were made in 2011. I haven’t heard any more recent comments from Michael Welner about the case. He has also never met Breivik, nor talked to him directly. Opinions are still deeply divided regarding Breivik’s mental state, and these divisions are likely to remain, even after the trial has been completed. Some of those who have examined him found him to be insane. Others emphasize his ability to plan ahead and cynically assess a situation as an indication that he has a twisted mind, but is rational overall. It is worth emphasizing, however, that both those who think he is insane and those who think he is sane highlight his extreme narcissism and exceptionally self-centered world view. That’s what this is really about: Making the entire world talk about Breivik. The manifesto itself is just an excuse for his narcissism, and the terror attacks a vehicle to achieve fame and notoriety. He wants to become known and attract attention, and committed an act so spectacular and shocking as to ensure that goal. Breivik is a rebel without a cause, or perhaps we could say a rebel searching for a cause to hide behind. Yet the cause he champions is mainly himself, his vanity and his grossly inflated ego; everything else is secondary. Welner sensibly points out that if Breivik had actually cared about ideology, he wouldn’t have committed an act so horrible as to scare off and alienate people who might otherwise be interested in certain aspects of an ideology. This is not about saving Europe, it’s all about promoting himself and his ego. That makes Breivik an extremely selfish individual. He hurts not only the victims of his terror attacks and their families, but also all of those individuals who one way or the other are mentioned in his manifesto and therefore get dragged into this horrible case against their will. Having finished reading through the manifesto in full — which I finally did on April 9 2012 — it seems likely that this result could be deliberate on Breivik’s part. Whether he is insane or not is hard for a layman to determine, but he clearly betrays a powerful sadistic element of his personality. The very last page of his manifesto contains a photo of Breivik together with what appears to be his mother and sister, whom he had accused previously in the same text of having venereal diseases because they’re “sluts”. One can only imagine how Breivik’s family must feel because of this. The same goes for his friends, who apparently had no idea of what he was up to regarding terrorism. Breivik himself indicates that they have been kind to him personally, but he nevertheless doesn’t hesitate to drag their names through the mud. The fact that he shows such cruelty or indifference even to his closest friends and family strongly indicates that he may have wanted to deliberately hurt those individuals whose texts he cited in his manifesto, myself included. Author Daniel Pipes, who is mentioned in the manifesto several times, suggested this possibility just a few days after the terror attacks had taken place. This hypothesis is greatly strengthened by a highly revealing quote on page 1399 of Breivik’s manifesto, where he states openly that his brief and quite limited association with the Progress Party in Oslo may now hurt that party in the public opinion. He derives great satisfaction from this thought. In remarks made to Jerry Gordon at the New English Review, Michael Welner stresses that legitimate causes must be differentiated from illegitimate means of pursuing those causes. For example, Joseph Stack claimed to be partly inspired by opposition to high taxes when he crashed a small plane into the IRS tax building in Austin, Texas in 2010. Obviously, that attack in no way delegitimized those who are peacefully critical of high taxes. By the same standard, Anders Behring Breivik’s claim to be inspired by certain anti-Islamic writers and European political activists does not delegitimize those who peacefully resist the spread of sharia law in their countries or are deeply concerned about the negative impact of mass immigration to Western countries. Unfortunately, the authorities and mass media haven’t always heeded this wise warning. Judging from the list of witnesses that is now being presented, the Breivik trial has ample potential to turn into a political show trial against any individuals and groups who have voiced substantial criticism of Multiculturalism, mass immigration, the EU and above all the doctrines of the Holy Koran or the Holy Labor Party. This is deeply regrettable. It is not just that I dislike being dragged into this personally, but this process also risks becoming an additional national trauma on top of the one that this tiny nation has already suffered, and will inflict new wounds instead of healing old ones. What is most disheartening, however, is that Anders Behring Breivik probably did all of this to gain personal attention, which he will now get in spades. He will be at the center of attention and the name on everybody’s lips, a dream come true for a narcissist. If the ruling from this trial is appealed, the next one is scheduled to begin in early 2013. Worst case scenario: this is just the beginning of Circus Breivik, with Circus Breivik — Season Two, continuing next year. Two teams of shrinks have now had a go at 'assessing' Breivik and have come to two different conclusions. My bet would be with the second team who have been able to spend more time with the mass murderer, and on the balance of probability, have gained more knowledge of how his mind functions. Narcissistic? Maybe we should all wait to hear what he has to tell us at his show trial before making such judgements. As Fjordman has indicated; 'Breivik really is hard to classify'. Fanatic? As Welner has also stated. 'A person who is a fanatic has ideas that are shared by only a few'? A question must be raised on that statement: What about Islam, the Nazi's, the Japanese Kamikaze and the Jewish Zealots? Could they not also be classified as fanatics? That Breivik likes to hog the limelight there can be no doubt, but is it because he is a narcissist, or is it because he has a message to tell? Nemesis: "but is it because he is a narcissist, or is it because he has a message to tell?" Dear Anonymous 9:55pm. How you have come to the conclusion that I condone what Breivik did is really beyond me, as nowhere in my comment do I even suggest that. You, like most people, automatically jump to the conclusion that just because you can't see yourself doing what Breivik did he must therefore be mad. Psychiartry is not an exact science. The reason that two teams of shrinks have come to two different conclusions in assessing Breivik is due to psychiatry being an inexact science. How do you think those two teams of shrinks would have gone assessing Hitler, Stalin, Mao or Pol Pot? Do you believe those infamous figures of history would have been labelled as mad, or just plain bad? Breivik is not insane and he has a message to tell. What he says in future will give some insight into what made him do what he did. So, so are you willing to listen or will you just shut your ears? Hasn't Breivik asserted repeatedly that he is a knight of some sort, an elite warrior in a non-existent group of knights that exist all around Europe? Doesn't the fact that this group doesn't even exist show that Breivik's mental gears were slipping? I'm pretty sure people would have noticed fellas wearing armour riding big horses around the streets of European cities; I'm even more sure that the police forces throughout Europe would have by now tracked down and arrested any of Breivik's actual fellow travellers, if they actually existed. And I'm certain that the press would have let us all know if any fellow "knights" had been identified & subsequently arrested. But none of that has happened. Because the group Breivik believes himself to be part of doesn't even exist. Breivik's world is founded on a fantasy, one which exists nowhere in this world, but only in his own mind. Isn't that a pretty clear indication that he's bonkers? Nemesis: Hitler, Stalin, Mao or Pol Pot??? come on, they probably where the most narcissistc with lack of empathy people who have ever lived!! it dont say abb is mad as a monkey, he knows what he did at some level, i belive. but because of his brain works different from poeople without a screw loose, he can do what he did and think he did somthing very smart to promte himself and his belifes. ive known of what he is "promoting" for a while. i even agree with in som points as i do with some of Bat Ye'ors points, i even agree with fjordman on some points. but for me islam and muslims aint the problem in europe. its mass imigration and something called the schengen agreement. (but it dont give me the right to kill anybody who dont agree with me and do what abb did to promote my belifes). best regards from "Anonymous 9:55pm"
We don't know if Breivik believe what he told to the police. He could have told a large bunch of lies because he want misdirect the police, because he want keep the people attention high or for any any other reason or combination of reasons. If Breivik is so smart, manipulative, forward thinking and determinated he surely think ahead what to write and what to not write, what to say and what not to say, what would be the reactions and the counter reactions to his actions. He had time to plan and meditate to the possible scenarios. He had contingency plans when the attack against the government building failed to obtain his goals. He was fast in executing them and the mass killing was only his last plan available before being identified, located and captured. The other two plans failed their objectives because the bomb was not powerful enough to collapse the government building and then when driving he was delayed by the heavy traffic and missed the Norse Prime Minister there. We do a disservice to ourself if we assume and presume Breivik is bonkers for what he did. This is like telling ourselves the evil people do is always due to a mental illness. This is not true. People perfectly integrated in their society is able to do as much evil as Breivik and sometimes more. They rise to position of power and wreak havoc in a society without considering the effects of their actions and when confronted with the effects of their actions claim "How could anyone know? - It is bad luck - I did nothing wrong - I was done with good intentions"
At least Breivik is not hiding or avoiding responsibility. The politicians writing (and keeping) the laws letting him free in 20 years don't. It is interesting Fjordman citing Joe Stackon to the IRS. We have AB Breivik, J. Stack and Tom Ball. All of them wrote the reasons they did what they did. They are part of the spectrum of responses people do when they face something they believe unjust unjust (it is immaterial others could think differently). Some kill themselves killing others, some kill themselves (in a gruesome way on purpose), some kill others. Here the value they give to their life and the life of others is different, the pain they are willing to sustain is different, the energy they had left to fight is different. 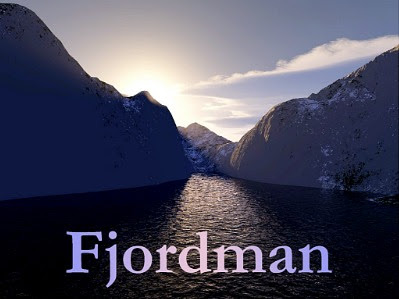 I understand the need for Fjordman to distance himself from Brivik's actions but I don't buy the claim he inserted on purpose his name (and many others) in his manifesto to damage him. If he wanted to really damage Fjordman he would have cited him many more times. "I don't see it. Therefore it does not exist"
How can the PC guerrilleros state that the knights, or rather ordinary European not content with a totalitarian ideology being forced upon them, do not "exist"? Your point about evil people walking among us is well taken. There are several books on Amazon on the subject of sociopaths living in society, and I do think there may be something to that. I am currently reading some of the Dexter novels, and surprisingly (or perhaps not too surprisingly), there appear to be quite a few similarities in the characters of the protagonist and Breivik. I believe he was a fan of the show. Oh please. Do learn to think properly before lifting up your keyboard, for goodness sake! 1. I don't see it therefore it doesn't exist. This is a well know fallacy. So is creating a straw man. 2. Normal people living in a European country with concerns about multiculturalism etc. do not equate to knights as imagined by A.B. The two things are completely different. David Cameron, Sarkozy, the German wifie and the Spanish dude with the moustache have all condemned multiculturalism as a failed concept. According to you this makes them knights in Breivik's imaginary little band. Which shows you just how absurd your comparison is. Discerning a fifth degree narcissist (see Lowen, Alexander: Narcissism: Denial of the True Self) is not difficult. From the beginning it was clear what Breivik was suffering from. Such disorders are inherited, as members of this man's family would likely know as there undoubtedly is a grandparent or the like in the woodpile. These people are very dangerous. Think OJ Simpson and Adolph Hitler.